The reality could have been different. 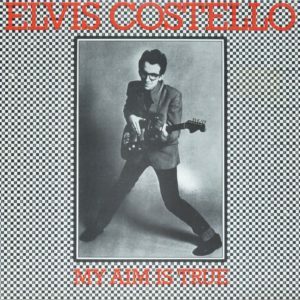 His debut long player, ‘My Aim Is True’, wasn’t designed as a Costello album. Its songs were working demos, created on the hoof by Elvis and members of Clover (yet to become Huey Lewis’s News) in various sessions, but completed in under twenty four hours. Conflicting sources claim the recordings cost £1,000 or even £2,000, but the reality is probably somewhere between. No matter how much the cost, it’s the energy of the performances that really comes through. Producer Nick Lowe planned for the recordings to be sent to singer, friend and retro enthusiast Dave Edmunds for possible consideration. Stiff Records got no interest from Edmunds and instead released the recordings as a finished album in July 1977. It appears the record label weren’t even sure of Elvis’s own potential at first, with early copies of the album containing a slip of paper that allowed the record’s buyer to claim a free second copy for a friend. So, with an almost desperate attempt at a marketing ploy and a demo-quality recording, what is it about ‘My Aim Is True’ that’s kept us all listening for forty years…? Sneering, of course. Despite being a pub rock album at it’s core and never quite the punk or new wave the record shops latterly insisted, the album had – and still very much has – an undercurrent of unease. Following the early success of the album, Costello returned to the studio with a permanent backing band, The Attractions, and recorded a single, ‘Watching The Detectives’. More in keeping with the new wave sounds of the time, the track became a huge hit in the autumn of ’77. His place in the rock history books seemed to be more than secured. After taking on The Attractions as his full time backing band for the next few albums, Costello went from strength to strength. While the run of albums from 1978-80 is arguably stronger and certainly more focused, it’s still ‘My Aim Is True’ which best represents his breadth of talent as a songwriter, a man able to turn his hand to a variety of genres. Looking back, perhaps this debut is reason enough for us not to be so surprised at those albums that have sometimes raised eyebrows for being particularly un-Costello-like, if there is such a thing – from 1981’s country album ‘Almost Blue’, to the Transatlantic roots lurking throughout 1985’s ‘King of America’, the torch songs and balladry of ‘North’ in 2003 and the brilliant collaborations with Burt Bacharach and Allen Toussaint. Always approached with an open mind, Costello never seems as much a man out of place, as a man out of time. A songwriter of classic songs. Elvis’s original plan for the songs which became ‘My Aim Is True’ eventually came to fruition too, with various bands and artists – from the punk scene and far beyond – putting their own stamp on a few of these early songs, so, when it comes to timeless material, maybe four decades doesn’t seem like such a long time after all. With thanks to Tommy, Kurt and Rich for their insights. This entry was posted in Miscellaneous and tagged clover, elvis costello, kurt baker, new wave, nick lowe, pub rock, punk by Real Gone. Bookmark the permalink.